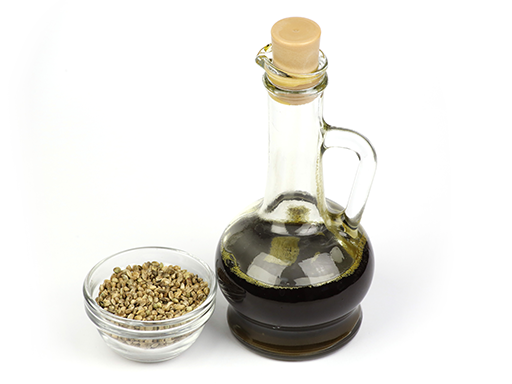 Hemp seed oil comes from the seeds of the hemp plant. There are two different ways hemp seed oil can be processed: Unrefined, cold-pressed hemp seed oil – this oil is green in color with a nutty flavor. Cold pressed hemp oil preserves hemp’s nutritious content, so it is often called “Nature’s most perfectly balanced oil”. It has a limited shelf life and should be stored in the refrigerator once opened. Refined hemp seed oil – this oil is clear and colorless. It doesn’t have much flavor and also lacks the natural vitamins and antioxidants that hemp is known for. Refined hemp oil is typically used as ingredients for body care products, fuel, lubricants, and even plastics.